As I mentioned in my previous post, I’m moving (and starting a house remodel!) in the next couple of weeks, and it’s all thanks to the determination and dedication of my realtors that I’ve found the perfect place that I can soon call home. While they’ve continued to diligently help me navigate the process of selling and buying a new home, they too, have been doing the same for themselves. In a matter of weeks, they’ve sold their current home, purchased a new one and are currently deep in the throes of their own ‘extreme home makeover.’ It’s been a relief to have people that are going through same process as you are—and at the same time—to bounce ideas off of and share resources with. 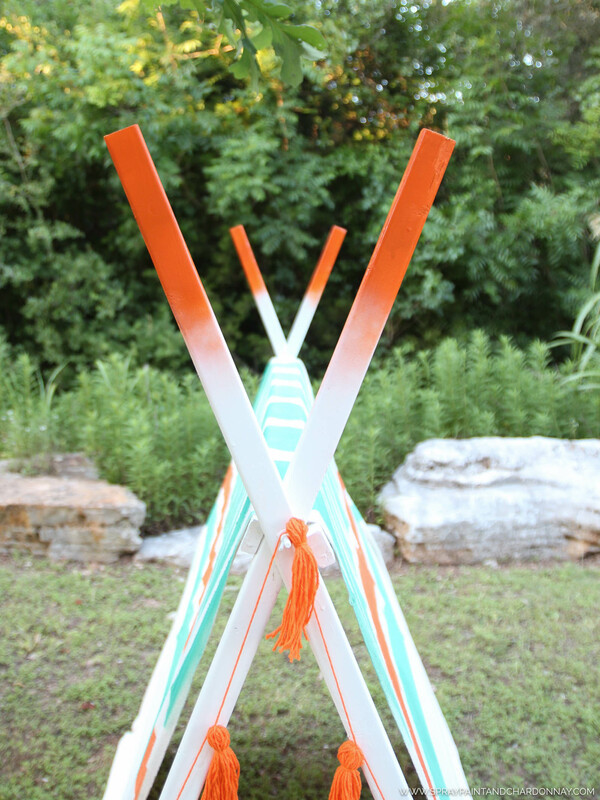 As a thank you for all of their hard work over the past few months, I wanted to make something that they—or really, their young daughter—can use and enjoy in their new space, indoors or out! 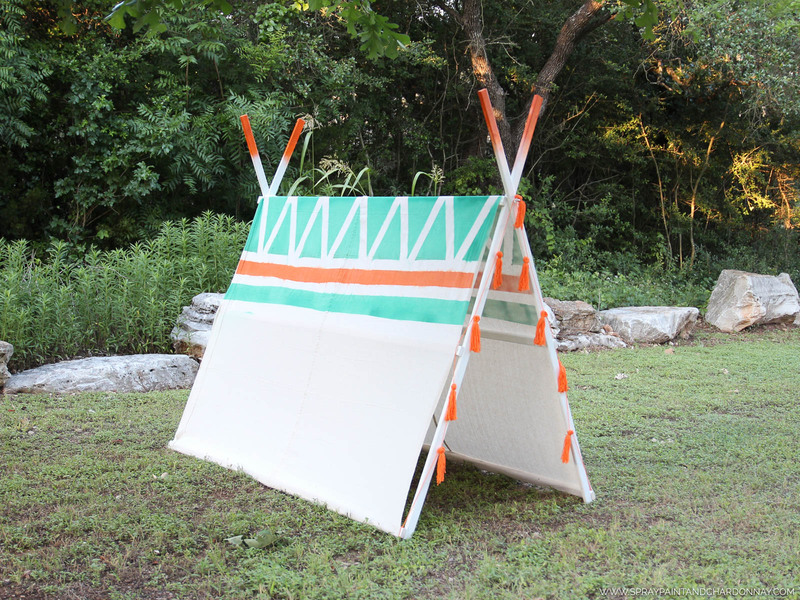 An A-frame tent makes for the perfect hideaway for little ones, whether it’s used as a reading nook, for backyard camp-outs, or just as a shady spot to cool off in the warmer months. Their new home has a pool, so I envision this to be their daughter’s own little poolside cabana this summer! All supplies and materials are available at your local Walmart. Before you start, be sure to sand any noticeably sharp or rough edges of the wood. No one likes splinters! You’ll need to make this project on a hard, flat surface, so I did this on the floor of my garage. Put two of the boards to the side, and place the other two boards on their vertical ends (¾” edge), so that they’re parallel from one another, and about six feet apart. Make sure that the holes you drilled are at the top end of each board. With a new board (no holes drilled in it yet), make a cross brace, and lay it (1½”edge face up) horizontally across the two vertical boards so that it is flush with the bottom end of each board. 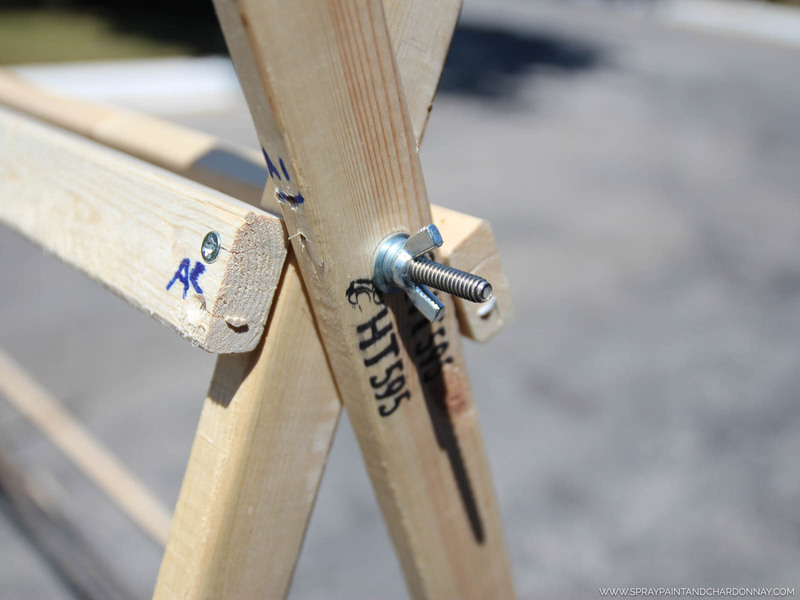 If needed, use a carpenter’s square to ensure that you have a 90° angle. Drill a 3/8” hole in each end of the horizontal board and then screw each end into the vertical (¾”) edge of the parallel boards. From the top of the bottom cross brace that you just drilled, measure 23” up and repeat the above process for the middle brace, using another board. 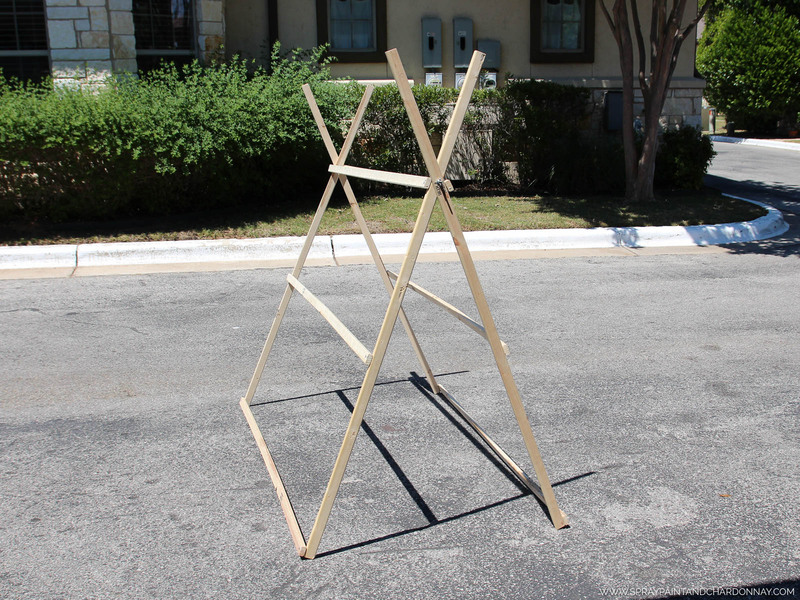 For the top cross brace, you’ll measure another 23” up from the middle cross brace and repeat again. 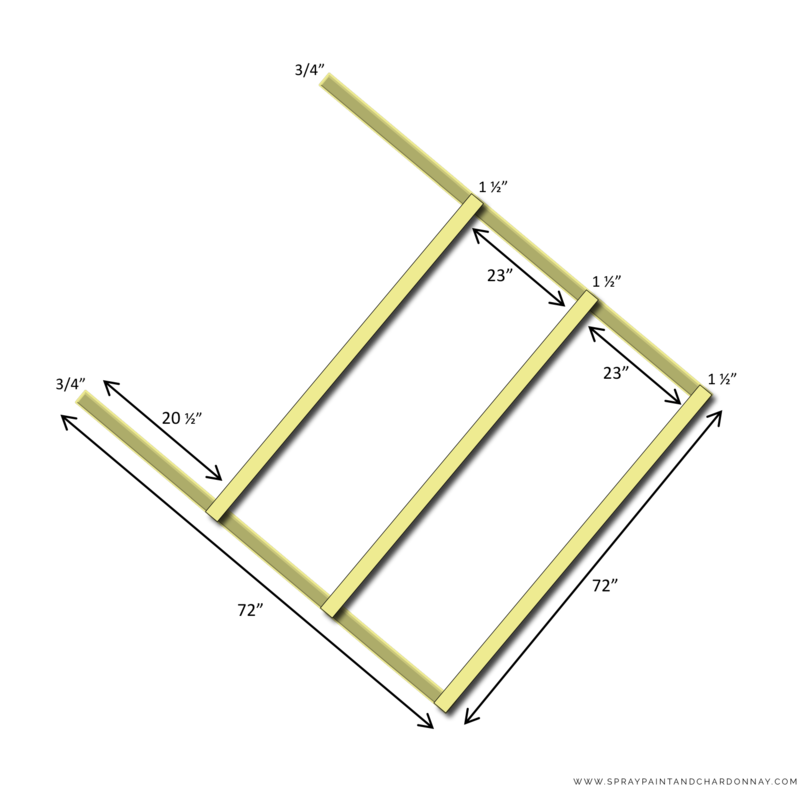 Now you should have two parallel vertical boards with three attached cross braces. See diagram below. Now, with the other two boards that have the holes drilled 20 ½” down from the top, repeat the steps above to create the other side of the tent. To join the two frames, stand them up vertically, with the holes drilled at the top overlapping each other. Place one of your washers on a 3/8”x2” hex bolt and slide the bolt through the drilled holes, and hold it in place with another washer and wing nut. Repeat on the other side. Spread the two sides about 3 feet apart to create the “A”, and tighten the wing nuts even more, if needed, to secure them. Whew! Now that the technical part is over, now for the fun part! 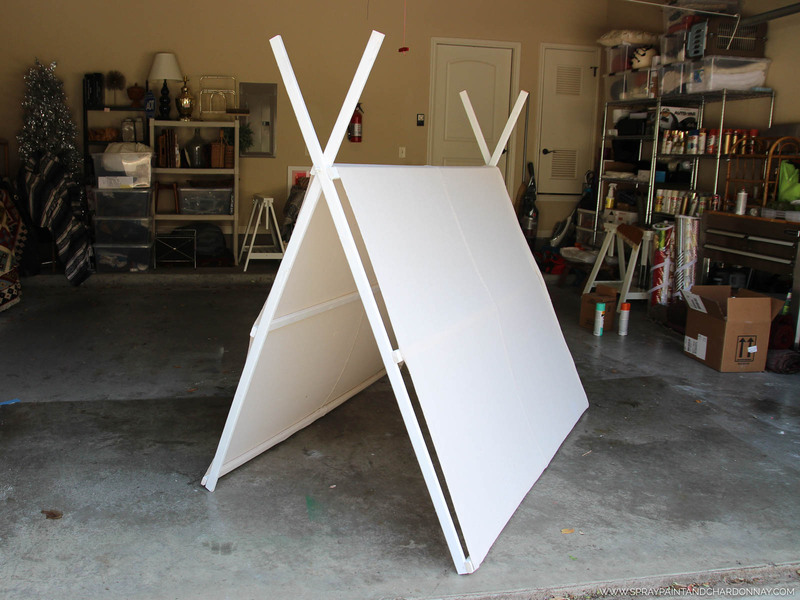 Using Krylon Dual Superbond Paint + Primer in Gloss White, I applied multiple thin coats of paint to the entire tent frame. Since wood is more absorbent or porous than other materials (i.e. 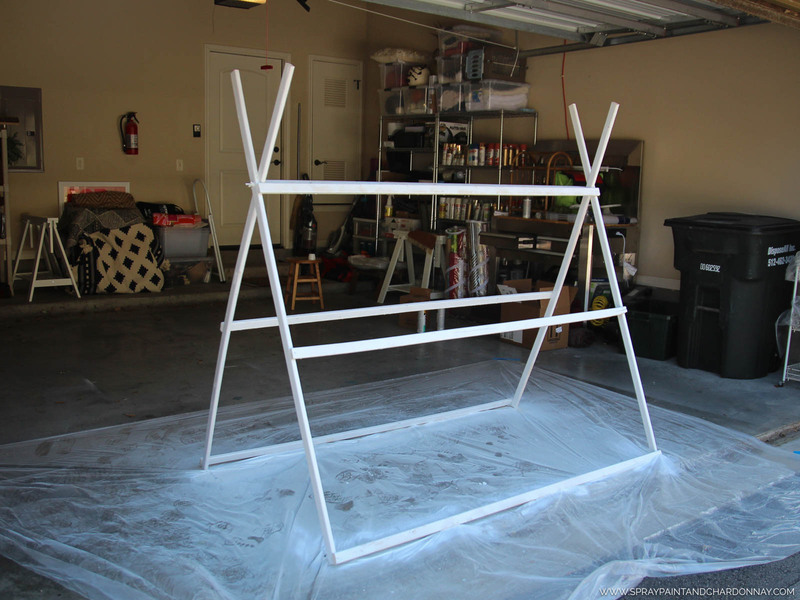 metal, plastic, etc…), this project required about four coats of paint. I used a little over two and half cans of paint. I love the Dual Superbond Paint + Primer because it has great coverage, doesn’t drip (always a bonus! ), and is dry to the touch in about 25 minutes. As with all spray painting projects, it’s important to read the safety and application instructions on the back of the can prior to use. After the paint on the frame was completely dry, about two hours later, I draped the washed canvas drop cloth over the frame. To attach the drop cloth to the frame, I pulled it taught underneath the bottom cross braces and stapled the hem on the inner side of the tent, so it had a nice clean edge from the outside. 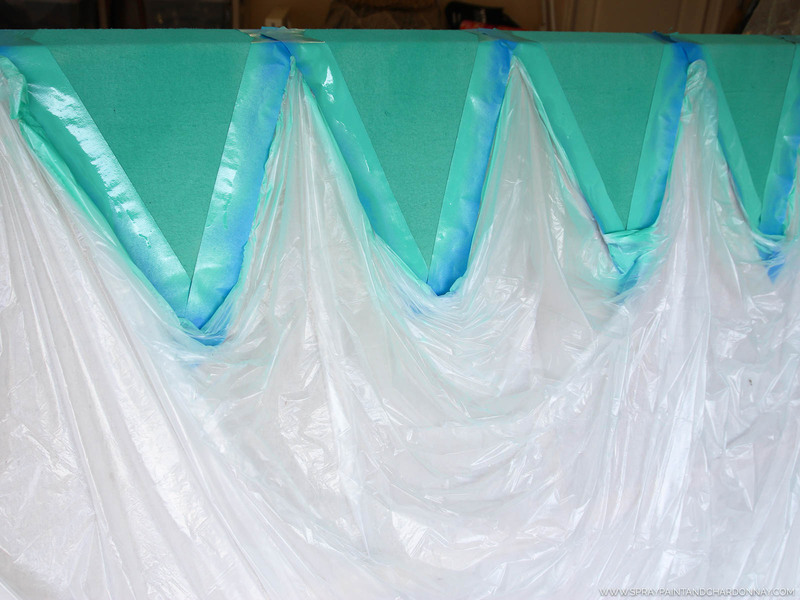 I used about eight or nine staples along each side to ensure that the drop cloth was securely attached. If you wanted, you could paint your design on your drop cloth prior to attaching it to the frame, but I wasn’t sure how the cloth would stretch after I attached it, so I opted to paint it on after the drop cloth was securely attached. 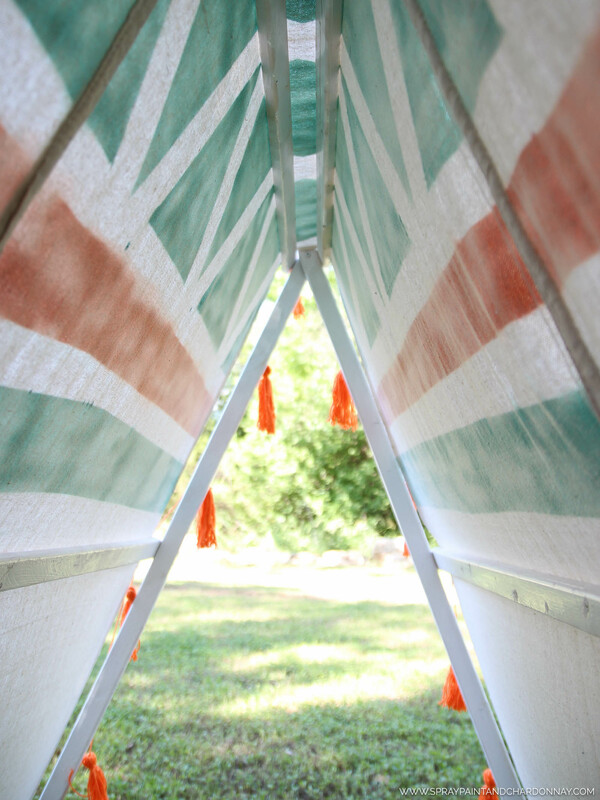 Using my ever-trusty blue painter’s tape, I taped off triangle shapes at the top of the tent to create my design. I followed them with alternating triangles below, and then two stripes. To ensure that I didn’t get paint where I didn’t want it, I used a plastic drop cloth to cover the areas I wanted to remain ‘paint-free’—including the white frame. For the triangle patterns, I used Krylon ColorMaster Paint + Primer-25% More in Satin Sea Glass. If you’re looking for the perfect turquoise color, look no further. This rich hue is my new favorite. 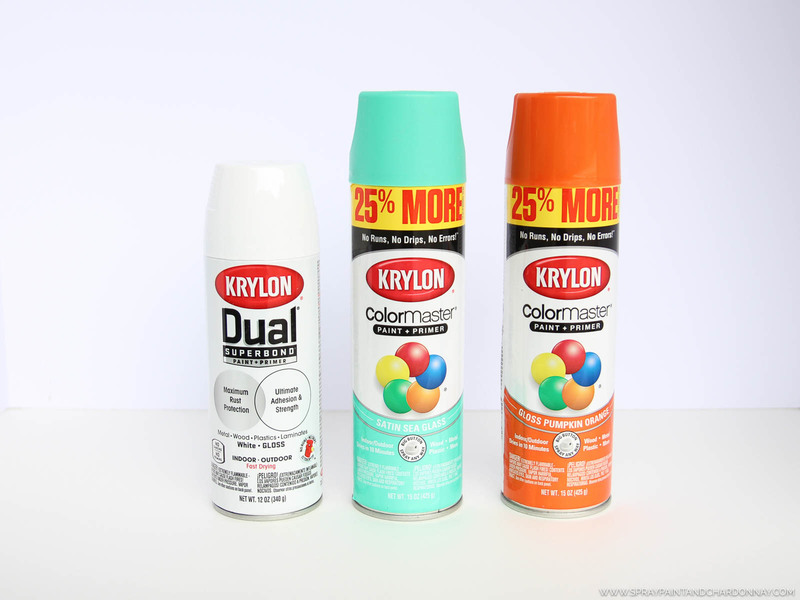 To add a little flair to the tips of the tent, I used Krylon ColorMaster Paint + Primer-25% More in Gloss Pumpkin Orange. I wanted to create an ombré effect, similar to my drink dispenser from last summer, so I followed the same process by gradually blending the orange into the white. While a little flair is never enough, I topped the tent off with some DIY’d yarn-tassel fringe, and just secured it with pins to the canvas, so that it can easily be removed if needed. And there you have it! A tailor (or Taylor, ha!) made tent that will hopefully bring lots of joy to one very joyful little girl!